I have worked with Job’s Daughters International in a creative role since 2003. In 2011 I was invited to join the Long Range Planning Committee to help the organization as a whole determine what its long range goals were, and to achieve them. One of the Long Range Planning (LRP) committee’s tasks was to revamp our branding, and appeal to a new generation of girls. An additional goal was to assist the Board of Trustees with determining an appropriate revenue stream for the organization via fundraising. As the organization is often compared to Girl Scouts, it was our mission to “find our cookie,” so to speak. To promote Job’s Daughters International’s new brand among our target audience (10-20 year old girls) while simultaneously raising funds for JDI. StikPockets are vinyl stickers that attach to the back of any smartphone or case, turning your phone into a wallet. They can be customized with a logo and sold or handed out for promotional purposes. I found the product via social media in June 2013, and worked directly with the owner/inventor Brian Owen to get all necessary information. I also negotiated a price point that would be mutually beneficial so that we could raise much-needed funds, and Mr. Owen could get important client feedback for the fundraising branch of his business. I designed four Stik Pocket designs (two for the initial launch, two for a follow-up fundraiser). I did market research and data analysis to determine the appropriate number of Stik Pockets to order, how many of each (black and white), and multiple price points (two retail, two wholesale) to ensure healthy profit margins for the organization. I secured a booth so that the Long Range Planning Committee could sell Stik Pockets at the organization’s annual conference (“Supreme Session”) in Oakland, California. I wrote a press release and sent it out prior to Supreme Session to get people excited, and come prepared to buy our product (or buy a bundle and bring it back to sell locally). I created fundraiser bundles, including a pricing chart, incentive ideas, feedback request, and a tracking form. 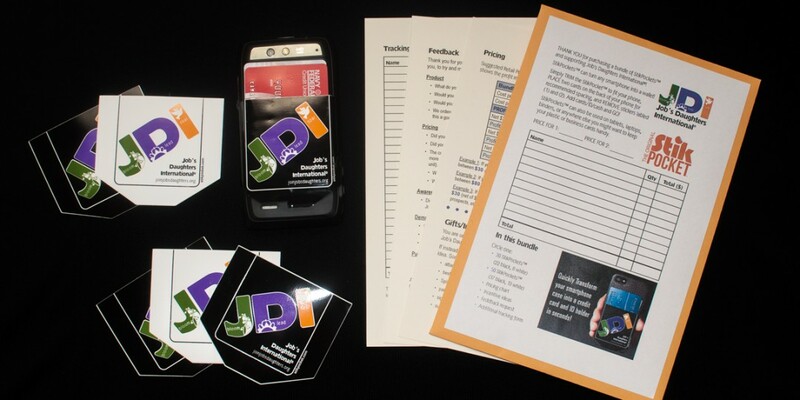 The Long Range Planning Committee came to JDI’s Supreme Session (i.e., annual conference, July 22-27, 2013) with 1,000 Stik Pockets. In two and a half days of sales (about 16 hours total), we sold out of all 1,000 Stik Pockets. Our final gross profit margin: 88%. The fundraiser raised nearly twice as many funds as the next two top-grossing fundraisers combined.